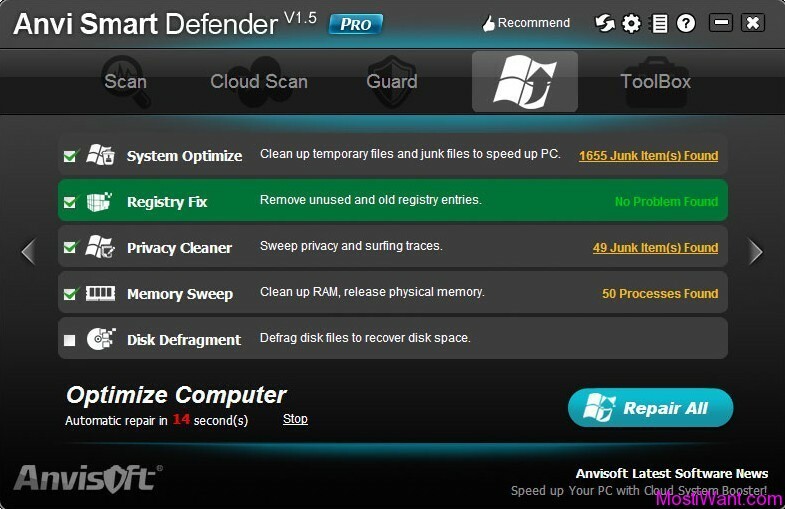 Anvi Smart Defender Pro, from Anvisoft Corporation (the creators of Cloud System Booster Pro), is an easy-to-use and lightweight detection and prevention program that offers multiple scan levels and and powerful protection against malicious software, as well as cloud-based scanning and extras that clean and optimize your PC and repair issues caused by malware and garbage files. With the fast & light engine, Anvi Smart Defender Pro can monitor every process and stop malicious processes in the background before they even start. With the newly designed swordfish engine, it scans and detects Internet security threats fast and lightly. Anvisoft Cloud uses creative Cloud Computing technology and Heuristic Analyzing mechanic to analyze the behavior of the security-related risks in a fully automated mode. Upload the suspicious file with a smart way, you can get the cloud security report and discover the newest threats at the first time. 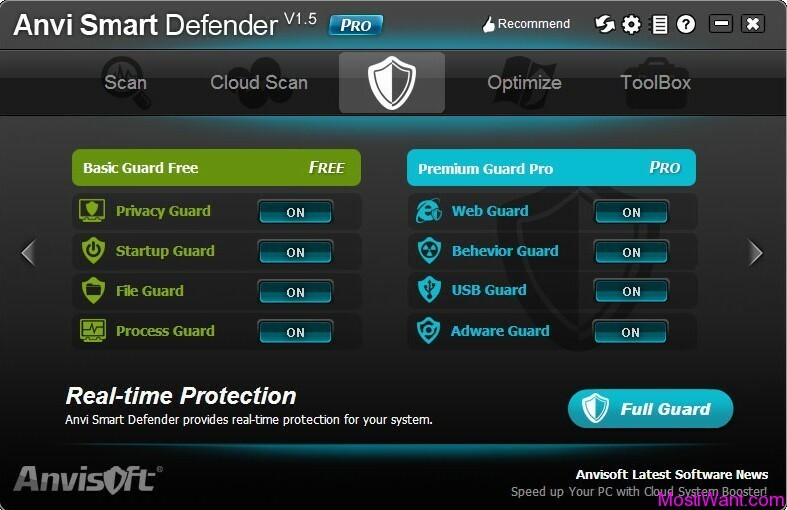 In addtion, Anvi Smart Defender Pro adds system optimization function to speed up slow PC and provides cloud scan feature to give PC more effective and powerful protection. 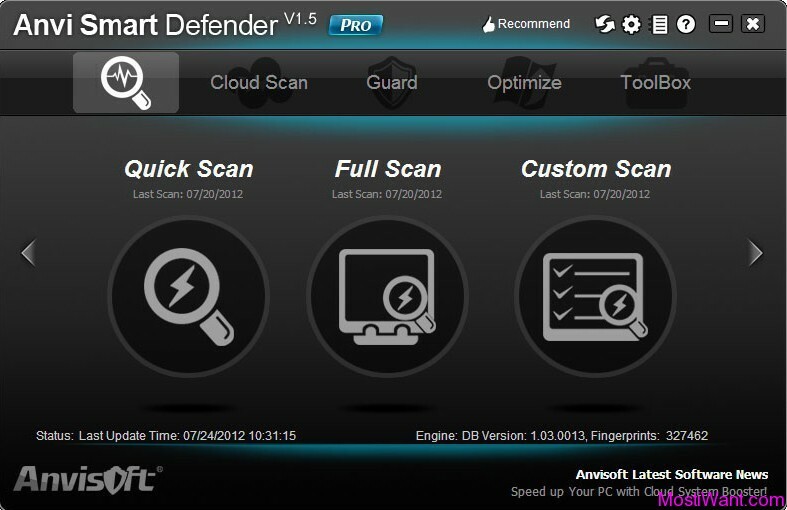 Anvi Smart Defender Pro has a very similar intuitive and easy-to-use user interface Cloud System Booster. There are five function modules: Scan, Cloud Scan, Guard, System Optimization and ToolBox. 1. The Scan function is based on known threats, with a continually updated database, it can detect the latest threats in order to protect users’ PC from malware threats. You can choose one of the three scan mode (Quick Scan, Full Scan, and Custom Scan) to scan your computer now. 2. Cloud Scan is a featured function of Anvi Smart Defender, which help users verify unknown or suspicious files on computers. With a simple “Cloud Scan” button, it will scan the most commonly infected areas of computer, and uploads the suspicious file to Anvi Online Cloud Server for verification if you choose. You can also directly drop a file to the window for analyzing. 3. Guard is the most need function of an anti-malware program. It provides real-time protection when users surf on the Internet, such as chat online, online transaction, bank check, browser website, etc. Anvi Smart Defender provides eight guards here: Privacy Guard, Startup Guard, Process Guard, Behavior Guard, Files Guard, Web Guard, USB Guard, Adware Guard. You can specify to turn on or turn off them. And you can turn on all guards by one-click Full Guard. 4. System Optimization is an assisting function of Anvi Smart Defender. Its goal is to help users speed up PC and gain new PC feeling. This module includes: System Optimize, Registry Fix, Privacy Cleaner, Memory Sweep, Disk Defragment. You can select or deselect each item according to your own preference by clicking the checkbox before each item. Click Settings to customize the specified settings for each section. Click Care Now button to Scan & Repair your PC problems. 5. ToolBox includes some freeware from the developer for extra PC maintenance: Cloud System Booster, Windows Update Downloader, and Anvi Ad Blocker. 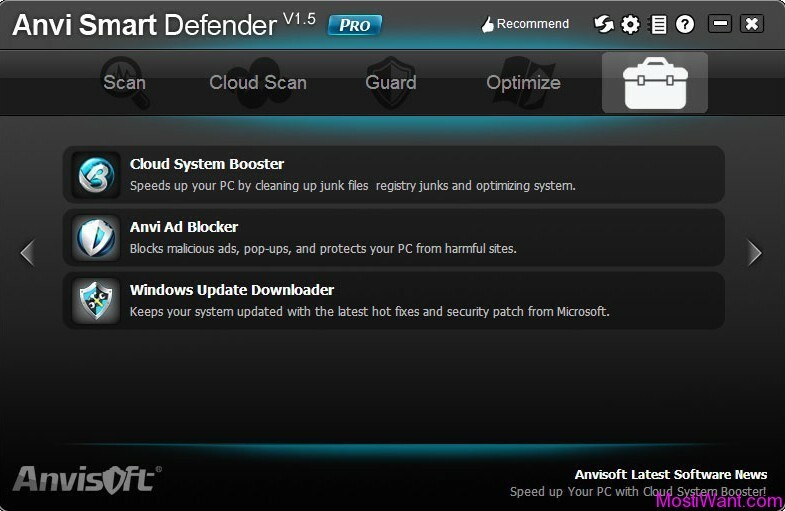 All in all, Anvi Smart Defender Pro performs very well as a new anti-malware tool. It will run perfectly along with your full antivirus software to act as a second line of defense. I’ve installed it in a PC combined with Avira Antivirus Premium 2012 without any slowing download or system crash. Anvi Smart Defender free version is also available that comes with with basic protection. 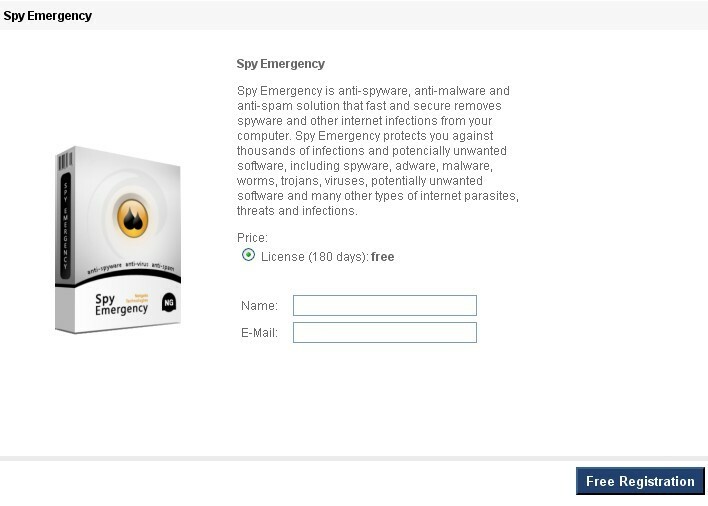 Free version lacks features like behavior guard, USB & external drive guard, Web Protection, and Adware Block. 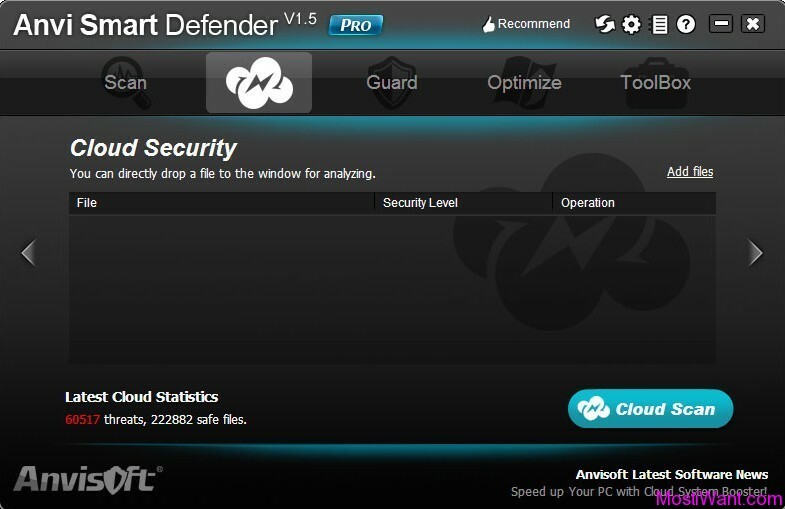 Anvi Smart Defender Pro is normally priced at $24.98 per license key / serial number. Now, in cooperation with Anvisoft Corporation (developer of Anvi Smart Defender and sponsor of this giveaway), we can offer 10 free serial license key to activate the Full Version of Anvi Smart Defender Pro. To participate in the Giveaway, you must follow the rules below. 1. Share this post on your blog, forum, or on any social networking site and place its status URL here in the comments. Remember to make it public so that I can verify that you’ve done that. 2. A valid email address must be entered on the “Mail” field (I will contact the winners by email). And do NOT post email address inside comments to avoid spam. 3. The winners (10) will be drawn then announced on this page after 1 week (7days). Wish you good luck! Thanks. Please count me in! Hope I will get one license. I attempted a post yesterday, don’t know what happened? Please count me in for this giveaway contest. i very much needs this software.it’s features are so wonderful.Please select me this time for that giveaway. dobry program chce go uzywac prosze mnie liczyc. Thank You so much Dear for this Giveaway. I wish to have it for Ad-blocker. I’m little interested about this thing. Please count me in.